Last Friday, I watched President Barack Obama go for a stroll down Lake Street, followed by a small entourage and serenaded by a violinist who played Pachelbel's Canon. The president said nothing to us—probably because he was made out of butter. The Obama butter sculpture's procession through the Loop, which you can watch in TOC's slideshow and video, was arranged by local artists Adam Brooks and Mathew Wilson, a.k.a. Industry of the Ordinary. The performance, The Harvest, is part of their retrospective "Sic Transit Gloria Mundi," which is on view at the Chicago Cultural Center through February 17. Read more about it after the jump. "It was an incredible experience," Wilson told me by phone on Monday. "As we moved along, people were interacting with us, talking about Obama, talking about what we were doing, talking about what they thought the state of America was. Just the kind of conversation that we hoped to instigate by generating a spectacle like this." Wilson and Brooks insist The Harvest has no political message. "Some people thought that making the president into butter was dismissive of him as an individual, and others thought we were trying to get out the vote for Obama. I very much like the fact that you could take it either way," Wilson says. 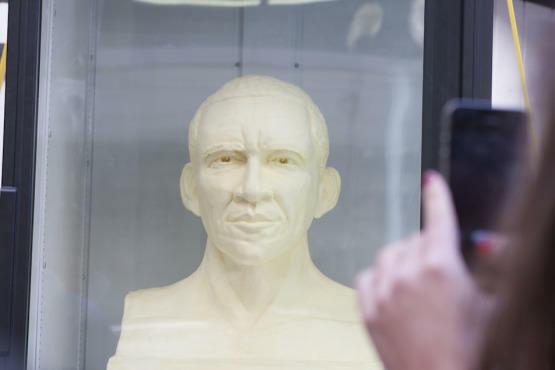 IOTO began dreaming of commissioning a butter sculpture of Obama after the 2008 election. "Regardless of your politics, he’s a fascinating historical figure," Wilson explains. The English-born artist is equally intrigued by the American tradition of presenting butter sculptures at state fairs. He and Brooks hired Cincinnati artist Bob Kling (who has sculpted cows and other figures out of butter for the Ohio State Fair) to create a bust of the president, which the artists transported through the streets in a glass cooler. Kling spent more than two days crafting the sculpture last week in a chilly temporary studio at Grant Park Packing in the West Loop. During The Harvest, Brooks and Wilson plugged in the cooler at various bars along their route to the Cultural Center (where the sculpture is now on display) to keep the butter from melting. "It helped that our thirsty assistants were willing to take part in drinking a couple of beers," Wilson says. As I stood outside Paddy O'Fegan's with a few of IOTO's Columbia College students, who kept an eye on the cooler, one driver after another slowed down to look at the sculpture. Asked why The Harvest elicited such an enthusiastic response, Wilson tells me that art is too often "presented in a very elitist environment, so most people think it has nothing to do with them. Our work seeks to suggest that art should be for all of us. Industry of the Ordinary…at least attempts to say that the accidental audience we happen across on Lake Street, as well as the people who work at the MCA, are all equal. That’s what’s so ordinary about it." "Sic Transit Gloria Mundi" performances continue Friday 2, 5:30–6:30pm, with artist Erik L. Peterson's Square Dance—a piece choreographed for two forklifts—on Daley Plaza (Washington and Dearborn Sts).